In April 2010, SEAHEC received a grant from HRSA, the Health Resources and Services Administration, to develop the Arizona Border Communities (ABC) Health Network/Red Sin Paredes. The network is a collaborative project of health organizations along Arizona’s border with Mexico. For the first time, health agencies in Cochise, Santa Cruz, and Yuma counties, were able to meet with their Mexican counterparts at the regional level to share best practices and work jointly on common health issues. The original network partners included SEAHEC and Mariposa Community Health Center in Nogales, Chiricahua Community Health Center in Douglas, Cochise County Health & Social Services, the Regional Center for Border Health in Somerton, and the Yuma County Health Department in Somerton/San Luis. The ABC Health Network supports and connects the bi-national community health councils (COBINAS) in each of the participating communities. 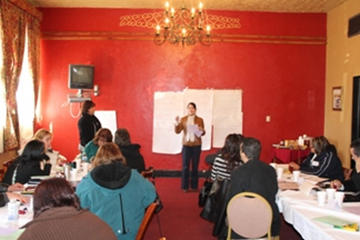 In February 2011, the ABC Health Network hosted a series of strategic planning workshops along the border in Douglas, Nogales, and Somerton, Arizona. Using a network development model known as I-STAR (Integrated System for Transformation, Appreciation, and Results,) Health professionals from both sides of the border identified top areas of concern for collaboration, and developed the network structure needed to work effectively together.